When you go to Copper at the Gate, you have the option to visit another person's town via Wifi or via the DS Suitcase. The DS Suitcase allows you to visit another player's town in AC:CF without using WiFi, and move your AC:WW game over to AC:CF. Select "I wanna go out!" On your DS, select "DS Download Play" and download the DS Suitcase. 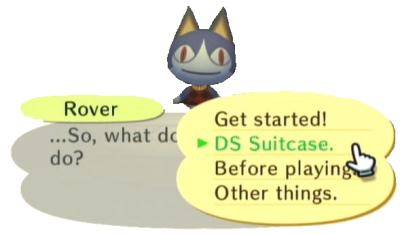 On AC:CF, select "DS Suitcase" on Rover's menu. Note: When you've finished at the other town, make sure to return back correctly, else you'll lose your items, bells and letters you had before leaving. Turn on your DS with AC:WW and select "DS Download Play"
Note: Only your characters face, name and some catalog items will be transferred. Money, items in your pockets and accessories WILL NOT be transferred. Also, when transferring from AC:WW, you also keep your hair style along with your selections. Transferring your character does not remove the character or any items from AC:WW. You can transfer up to 4 characters into AC:CF from any AC:WW game. Gracie's Model Car, Four-leaf Paper, and Birthday Card (Paper) are ONLY available in AC:CF if transferred from AC:WW. Usually one/two villagers will transfer over and appear in your town at the start; you'll need to rebuild the relationship. If you have a US copy of AC:WW, you are unable to transfer the character to a PAL (Europe) AC:CF game.